After last week's delicious foray into veggie tops from the market, I was thinking about the spring farmer's market and Berkeley Bowl bounty all week. 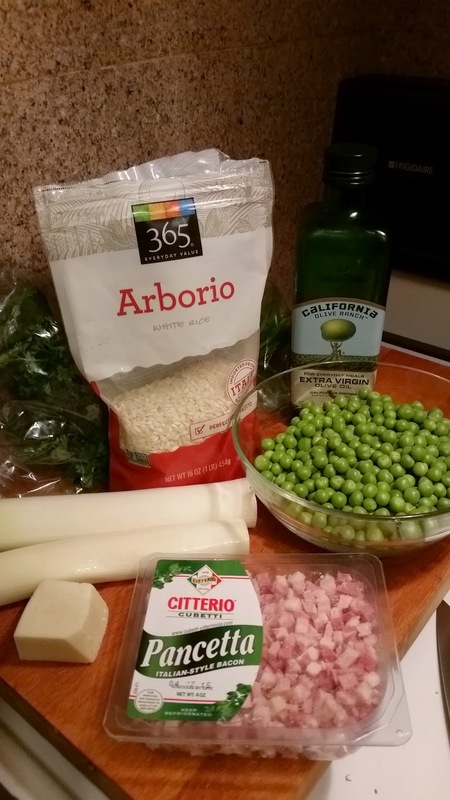 English peas and leeks are in season here, so they inspired this recipe along with the bag of Arborio rice in my cabinet and the small piece of Asiago cheese in my fridge. If you're still stuck in the snow, most of these ingredients are available at supermarkets, and you can always use frozen peas. Fresh asparagus would be a nice addition or substitute for the peas as well, but definitely not frozen asparagus! 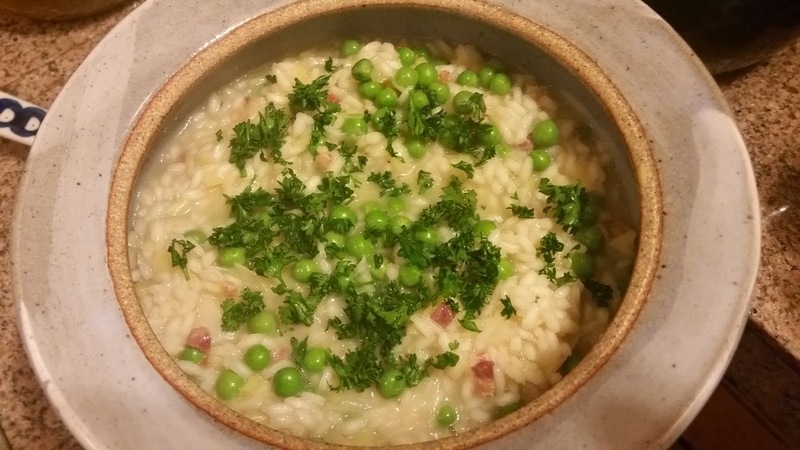 Shelling peas might sound like a pain in the neck, but it's actually not that bad. It'd be a fun way to get kids involved in the kitchen, kind of like shucking corn in summer. The amount of peas indicated below is meant to be post-shelling. 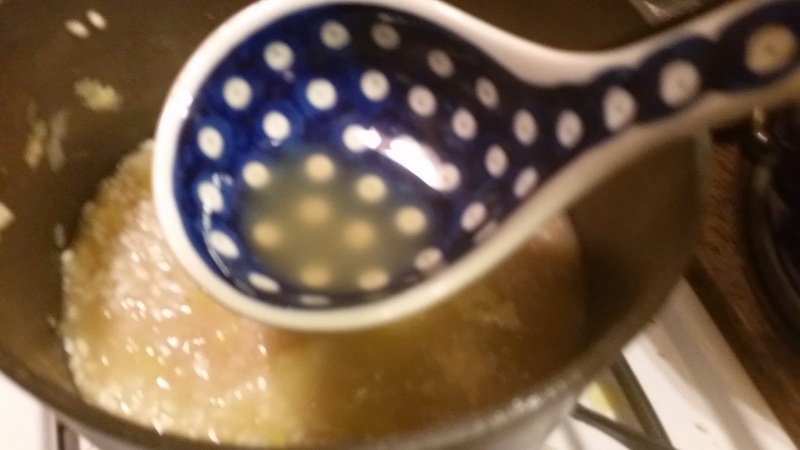 4 cups veggie or chicken broth, (Oops! Not pictured.) homemade or low-sodium boxed), warmed. You probably will only need about 3 to 3 1/2 cups. If you're using canned or boxed broth, throw a couple of veggies into the pot you warm it in to add a little more fresh flavor. I was planning to make chicken broth, but left the bones out too long and had to pitch them. Wah! Wash the leeks well, rinsing between layers in case there's any sand in there (also a good kid task). Chop into slices and set aside for a minute. Put the pot of broth on the back burner and keep warm. Put a straight-sided skillet or saucepan on the front burner. 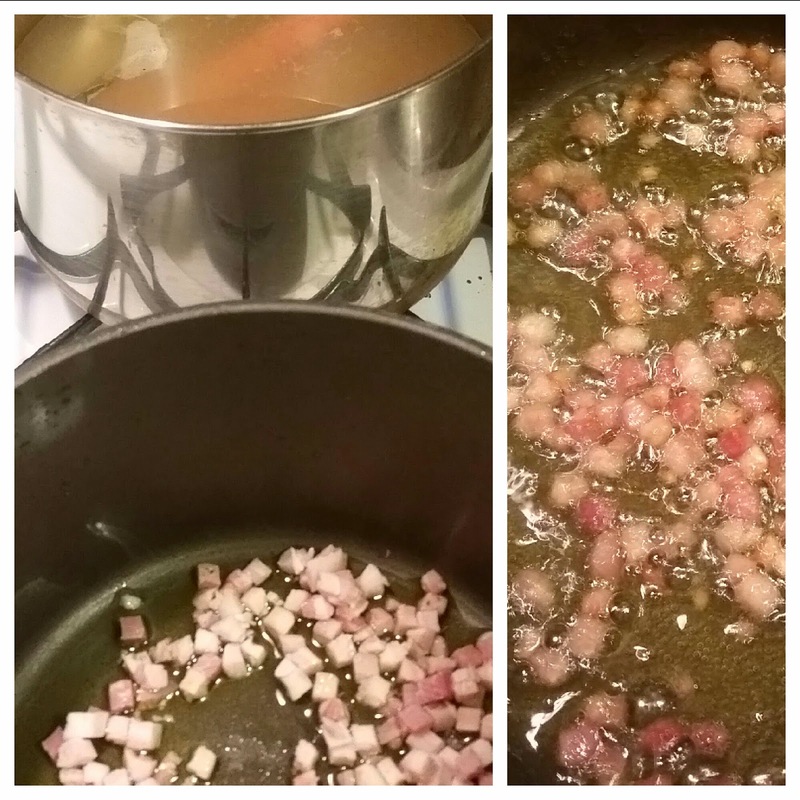 Put the olive oil in the front pan, heat to medium-high and add the pancetta. When the pancetta is getting almost crisp and slightly brown, take it out and set it aside. If there is more than 2 Tbsp of fat in the pan at this point, pour off the extra. If you're keeping it veggie, just add the butter to the olive oil. Go right to the next step when the butter melts. 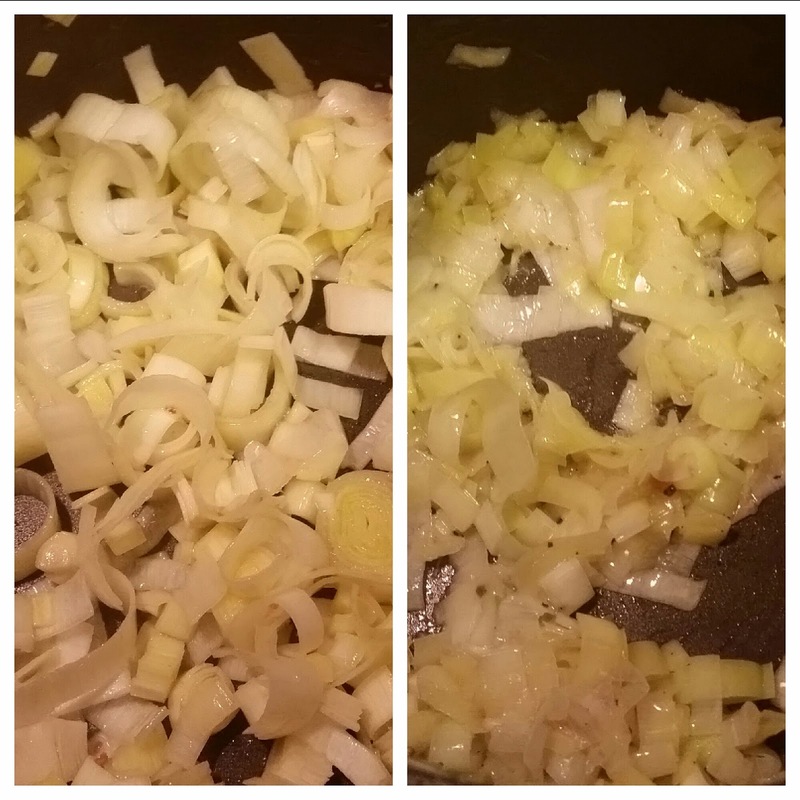 Add the leeks to the pan. Let them get nice and soft like this, making sure not to brown them. Add a teensy pinch of salt to the leeks while you saute them. 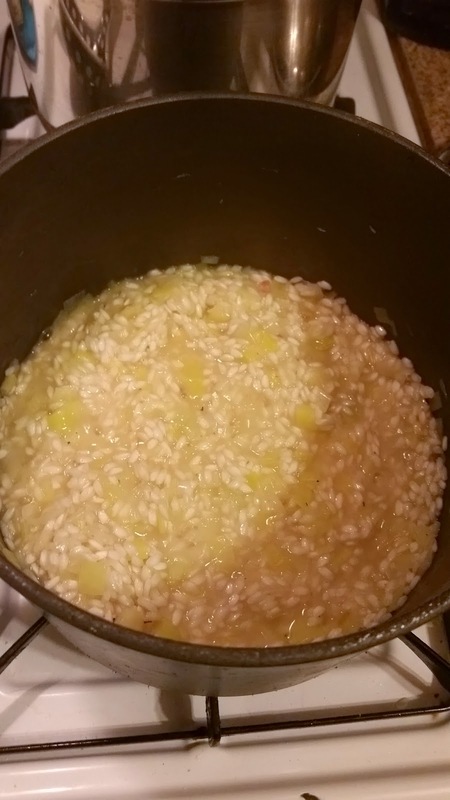 Add the Arborio rice to the pan and cook, stirring constantly, for one minute. Add the white wine to the pan, cook and stir for one to two minutes until the alcohol burns off. 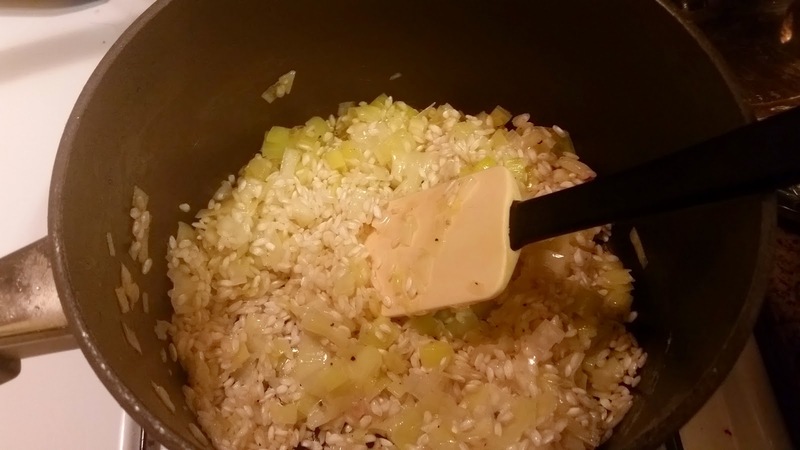 Add a couple ladle-fuls of broth to the rice. Stir very frequently, not necessarily constantly. If you haven't yet, grate the cheese and set aside. Ladle more and stir more. Keep ladling and stirring for about 15 minutes. Then start tasting the risotto for doneness and seasoning. You want it just a little underseasoned since you're going to add the salty cheese. 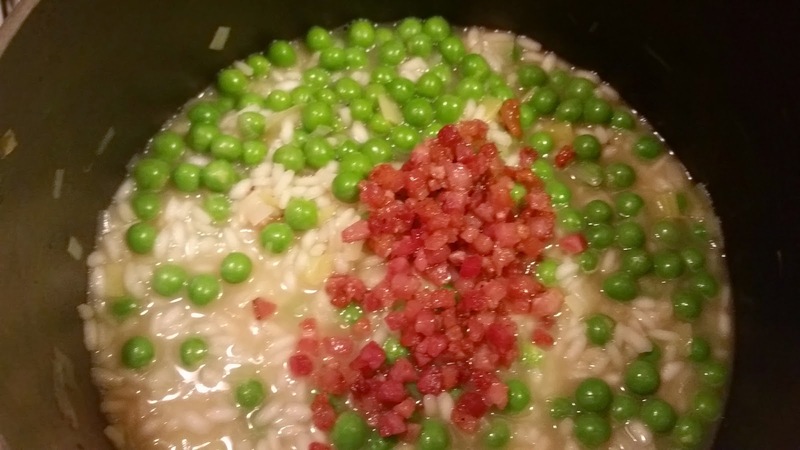 When it's almost but not quite done, stir in the peas and the cooked pancetta. Continue cooking, ladling and stirring until the rice is done, maybe a touch al dente and not mushy yet. 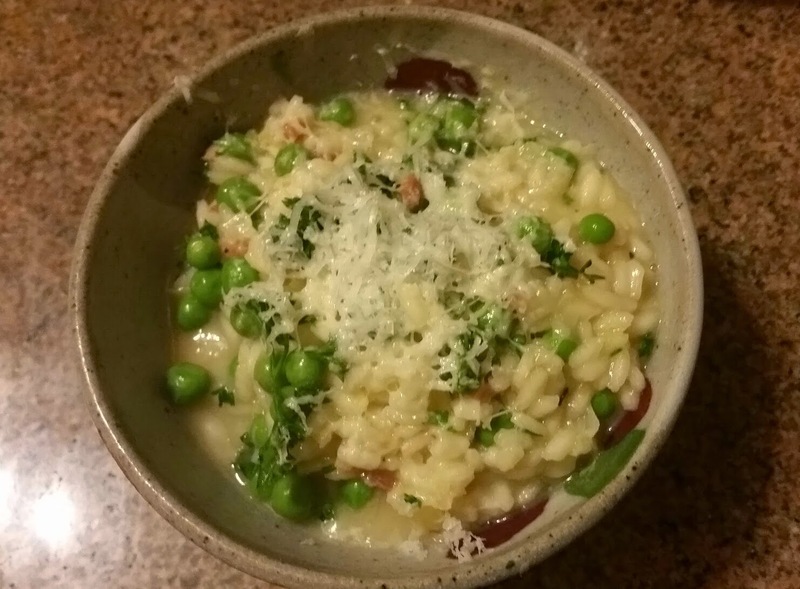 The risotto should be a little bit loose, not too soupy but not too dry. You may or may not end up using all the broth. When it's done, remove from the heat and stir in the cheese. Serve in a pretty bowl topped with more grated cheese and chopped parsley leaves. You know, unless you hate parsley, in which case, skip that part. Buon Appetito!